When R.J. Cole, a senior point guard at New Jersey’s storied St. Anthony High School, committed to Howard University last month, the decision was not just unexpected but shocking. The 6-foot, 170-pound floor general had the University of Virginia, Georgetown, Brown and a lot of other big-time programs vying for his services. Why would he choose a historically black university (HBCU) over the greater exposure guaranteed from TV-friendly larger schools? That’s the mindset that has haunted HBCUs and their athletic departments since segregation ended and black athletes were no longer confined to the black schools created to nurture and guide them in a world that devalued their educational experience. The long story of historically black colleges and playing tournament Cinderella upstarts begins with a team and coach whom Brand openly admires — Ronald “Fang” Mitchell and his 1997 Coppin State University squad. Mitchell is a living legend in the black college basketball universe. He coached Coppin, his alma mater, from 1986-2014 (and Gloucester County Community College from 1978-1986). 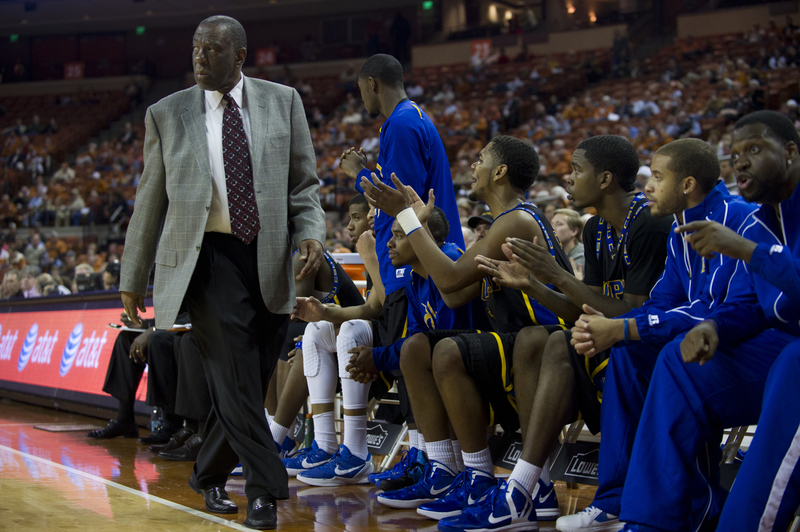 Head coach Ron “Fang” Mitchell of the Coppin State University Eagles calls a play against the University of Texas Longhorns on November 12, 2012 at the Frank Erwin Center in Austin, Texas. His 429 Division I victories place him in the top 100, with 11 consecutive winning seasons from 1989-1999 and nine of the 10 MEAC championships during the 1990s. His loyalty to Coppin State ran far beyond the one item the university was strapped for — cash. In 1995, Mitchell chose to remain at the campus located on West North Avenue in Baltimore despite the temptations of South Florida and Florida International University offering him double the salary Coppin could afford to pay him and a guaranteed job for his wife, Yvonne. Mitchell, however, is most remembered as the architect of the 1997 Coppin State squad No. 2 seeded South Carolina. The team nearly reached the Sweet 16 that year, but lost its second-round matchup to Texas by a single point. SportsCenter ranked the victory as one of its 10 greatest tournament upsets. Success on big stages isn’t uncommon for HBCU basketball programs. Schools such as Hampton and Norfolk State secured their own March Madness upsets and are often resurrected every spring when the tournament returns. It’s sustained success — a la Butler University — that eludes black colleges. Lack of funding and exposure and misperceptions plague HBCUs, and in particular HBCU basketball programs. Historically black institutions are historically underfunded. And only recently have black schools’ athletics been featured more often on television. The deeply ingrained perception is that HBCUs are a demotion in education as well as athletic experience. It’s said that a student-athlete’s desire for a brighter future for himself comes at the expense of attending an HBCU. And when a big-time athlete does attend an HBCU, there’s often an assumed catch — his grades are bad or he got in trouble. Never because it was his first choice. That perception is damning. “The lack of exposure had a lot to do with why a lot of the great athletes started going to the majority [white] schools. Then the fact of how they treated them — the equipment, the travel, the facilities, you could go on and on. It made it harder to recruit,” Mitchell said from his home in Kennesaw, Georgia. Recruits’ parents occasionally proved detrimental, too, harboring the belief that larger predominantly white universities automatically ensured a better opportunity to be drafted. 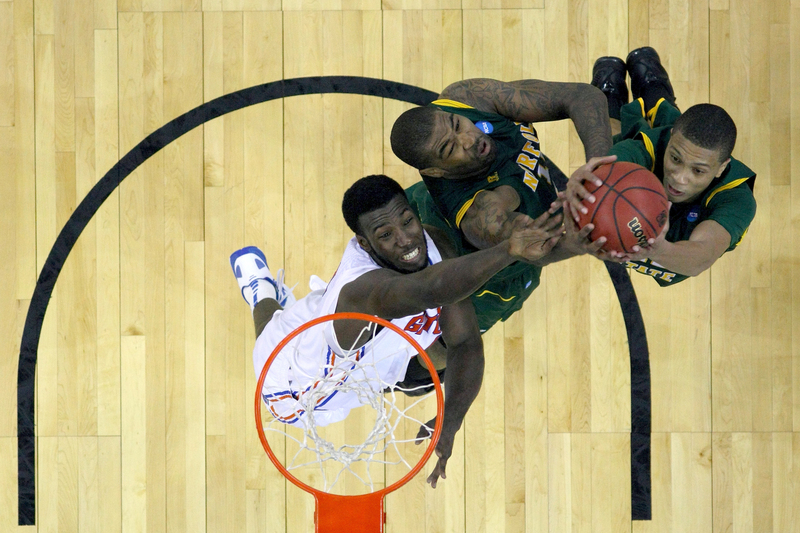 Patric Young #4 of the Florida Gators fights for a rebound against Kyle O’Quinn #10 (C) and Pendarvis Williams #11 of the Norfolk State Spartans during the third round of the 2012 NCAA Men’s Basketball Tournament at CenturyLink Center on March 18, 2012 in Omaha, Nebraska. Brand experiences many of the same hardships from the high school level. Numerous HBCUs reported record student enrollment increases in 2016, including Shaw, South Carolina State, Tuskegee and Virginia State. Dillard University president Walter Kimbrough noted that the country’s racial climate on college campuses in recent years plays a significant factor in the trend. What this means for athletic programs, in particular basketball, remains to be seen and is still largely a glass half-empty-and-full scenario. The tick upward in enrollment pleases Mitchell. Having interacted with parents and served as a father figure for thousands of young men in a key period of their lives, the desire for not only a quality education, but immersing these young men in an environment they can benefit from, he sympathizes with that. Mitchell becomes far more cynical when including athletics on the palette. It’s a situation too far entrenched in the fabric of college sports. Brand is a lot more hopeful. “Realistically hopeful” is perhaps a better term. Money benefits presentations, which often is the deciding factor for a recruit when visiting a campus. HBCUs are in a constant tug of war to obtain the resources their predominantly white counterparts flaunt. Still, R.J. Cole committing to Howard is noteworthy. Brand would love to see a top 20 recruit — one all but guaranteed a lottery selection in the NBA draft — spend one year at an HBCU. Not only for the goodwill it would bring for the school or the potential marketing come March Madness, but more importantly for the personal development of the recruit. He’s a testament of that decision. The lessons and experiences that HBCUs provide helped mold Brand into the man he is and the one he hopes to continue to mature into. The sentimental and historical worth of HBCUs are well-documented. Look no further than the prominent role these institutions play in the National Museum of African-American History and Culture. But so are the lack of financial resources. And until that changes, not much will in its athletic programs, including basketball, to achieve long-term, mainstream sustained success. Have faith like Coach Brand. But it’s almost impossible not to feel like Coach Mitchell. Correction: An earlier version of this article incorrectly said Coppin State was the first HBCU to win a NCAA Division I men’s basketball tournament game when it upset South Carolina in 1997. The first HBCU tournament victory was in 1980 when Alcorn State basketball team defeated South Alabama 70-62 in the first round.